This stunning publication is from Wide Eyed Editions, the publishers of the amazing Atlas of Adventures, and Destination: Space. Extraordinary in every way with illustrations in coloured inks, this oversized 85 page book is an atlas of information on animals. It covers their incredible and at times unbelievable behaviour, migratory habits and life systems. Added to the 31 comprehensive, double spread entries in full page colour, is a World map and six other double page maps that cover Africa Europe, Asia and the Middle East, Australia and Oceania, North America, Central and South America, and Antarctica. The detailed life and habits of the animals belonging to each area are presented under their country headings. There are miniatures of each map in a circle on the introductory page of each entry. A framed picture points out the major parts of the designated animal’s body and their use, and a large block of facts introduces the main information. Curves and waves of floating text upon the page give us a thorough insight into the animal’s life and behaviour. There are quirky little additions to some illustrations to add fun and humour, and for the observant eye to detect. 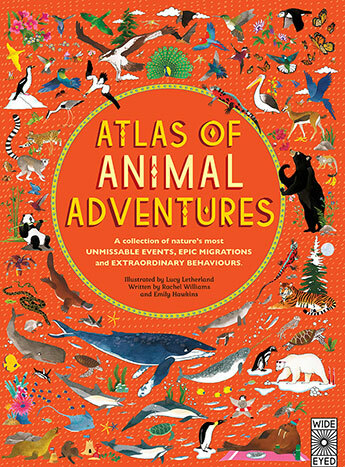 The cover depicts a brilliant collection of all the animals in the book in motion across a bright orange background. The front fly pages depict all the showcased birds. The back ones have a river of swimming whales and sharks. At the end, there is a Can You Find challenge to discover where the listed animals are found. Even the Contents page is entertaining! Atlas of Animal Adventures is a standout book with which children can enjoy learning about countries, rivers grasslands, and many species of animals, mammals, insects and underwater creatures. I loved everything about this publication: the detail, layout, colour, presentation and outstanding amount of facts contained on each page. It’s definitely a not-to-be-missed addition to any bookcase.